''On The Beach!'' You'll wish you were here!! View from the deck. 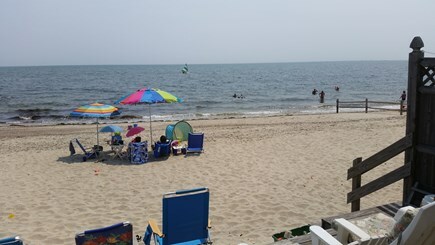 Vacationers enjoying the private beach. View from the shore. Units B&C. 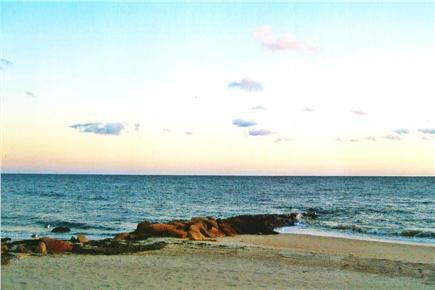 Beach: On the beach facing Nantucket Sound!!! 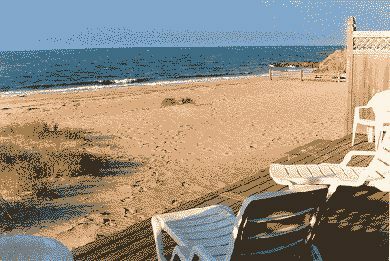 Our beach house is a large ranch-style triplex with three modern and comfortably casual condos, all set on a very large parcel of beautiful and private sandy beach...used only by our renters. The lovely sandy beach slopes gently to the warm ocean water and is perfect for even the youngest of children. Everything is right here so nobody has to leave the beach...and it's so easy to get a cold drink or stop for lunch without having to pick-up or pack a thing. Of course, the ocean and beach are the best reasons to be here, but the condo is also lovely, well-appointed, clean and clutter-free. 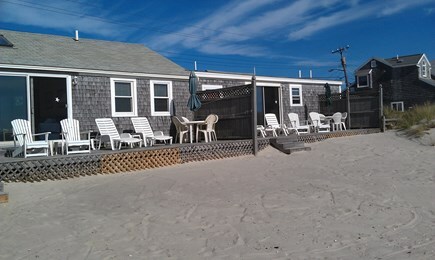 While some people never seem to get off the beach and deck, we have many activities and restaurants nearby. 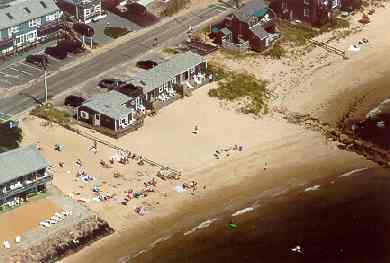 We are 2 miles to the start of the bike path in Dennis, 1 mile to renting kyaks,1 mile to West Dennis Beach, and best of all a 1/2 mile walk to the Sunday School Ice Cream Parlor...a nightly ritual with many of our renters. 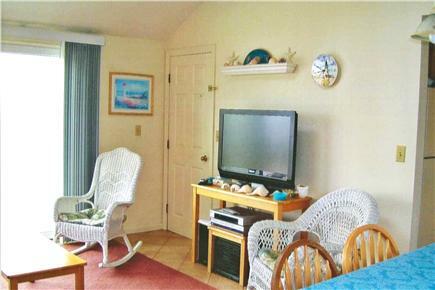 The condo has everything you'll need for a great vacation! The kitchen has a full-size stove and full-size refrigerator, dishwasher, microwave, coffee-maker, toaster, blender, pots and pans, dishes and glassware. Although we do not have AC as the slider doors to the deck are always open, each bedroom has either a ceiling fan, a stand-up fan, or one on the bureau. There are 32 inch flat screen TVs in the living room and a DVD/VCR combo, as well as hi-speed wireless internet. The bathrooms have a shower and a full-size bathtub (also a hot/cold outdoor shower on the deck). In addition, the condo has beautiful, textured, solid porcelain, ceramic tile throughout. It feels terrific on your bare feet! The condo offers wonderful and expansive ocean views and sliding glass doors leading to its own thirty-three by ten feet private deck with chaise lounges, umbrella, table and chairs, and a gas grill. Look at the ocean, feel the breeze, and enjoy your coffee while the morning shines on you! 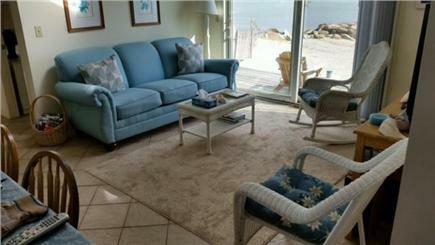 This condo (Unit B) is beautiful and well appointed, decorated in shades of blue, cream, and rose. The living room has a fan and skylight within the cathedral ceiling. 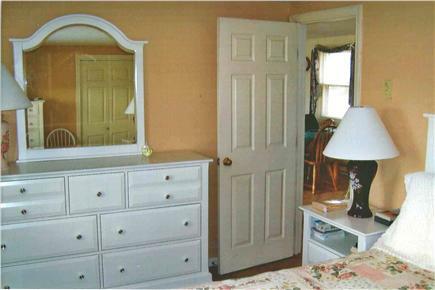 The master bedroom, facing the ocean, has a comfortable queen bed, a triple dresser with large mirror, a dresser and mirror, night tables with lamps, as well as a small chair. The second bedroom is also large and has a set of comfortable twin beds, in addition to a good closet, dresser and mirror. 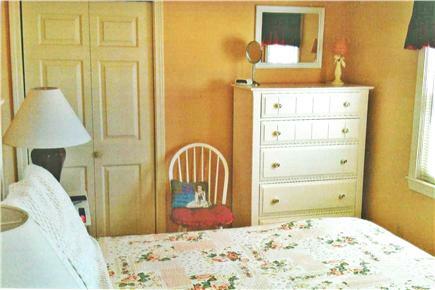 There is also a chair and floor lamp for some private time reading. 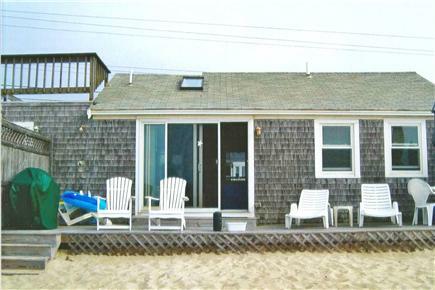 Nearest beach: On the beach facing Nantucket Sound!!! Everything on one floor. Step out to deck and beach.